Total Foundation Repair San Antonio is an industry leader with decades of experience in home foundation repair in San Antonio. Our residential foundation repair services include repairs for slab foundation and pier and beam structures, as well as effective drainage systems designed to drastically reduce damage from water saturated soil. Our foundation repair contractors, engineers, and install technicians are trained to high quality standards that our San Antonio customers have trusted for decades. If you suspect a problem in your foundation, don’t wait. Our 5-star customer service representatives will assist you during every step of the home foundation repair process and get you started by scheduling a free inspection. In the event that foundation repairs are recommended, you can rest assured knowing that Total Foundation Repair San Antonio lives up to our reputation, restoring you with total confidence in your house foundation repair. We are proud of our quality services and offer a warranty on all craftsmanship. Our excellent and knowledgeable client service agents are eager to answer your questions and assist you with the entire process. When to Consider Home Foundation Repair? A question homeowners dread asking, but repairs might not as complicated (or expensive) as you might think. However, don’t let that give you a false sense of security or reason to prolong the issue. Unlike a fine wine, structural problems don’t get better with age. An unresolved foundation issue can significantly decrease your home’s value and could put you, your family, and your belongings in danger if the foundation collapses. Furthermore, you might not even be able to sell the home if the buyer is going through a lender, which most are. Fortunately, there are warning signs that can alert you to the issue so you can preemptively search for a reputable company that provides house foundation repair in San Antonio. 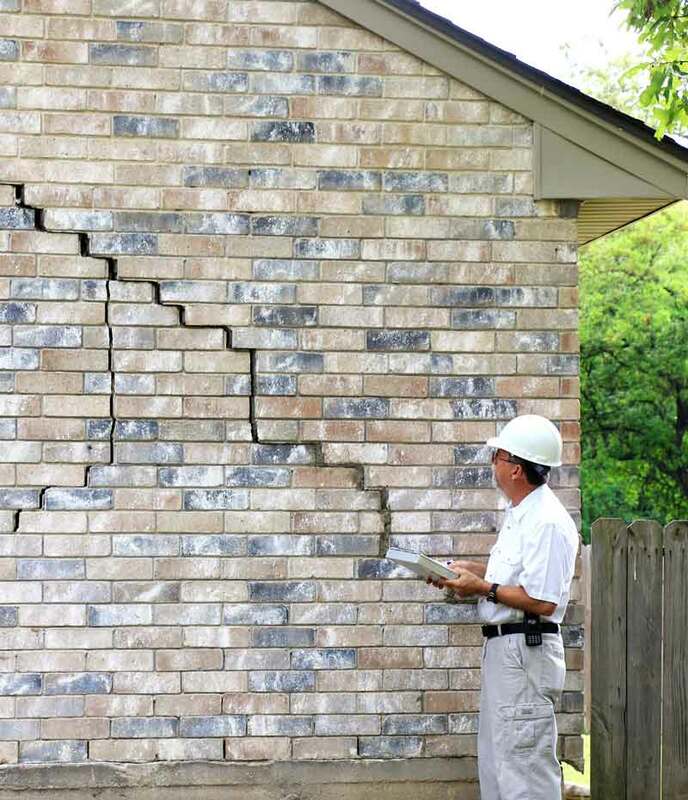 Cracks or fractures larger than a ¼ of an inch in your home’s foundation, floors, walls, brick siding, fireplaces, or chimneys can indicate a serious issue. However, it is acceptable for hairline cracks to develop within the first few years after the home’s construction. The direction of the crack(s) also matters. Vertical cracks are often less severe than horizontal ones, as the former run along the same direction as wall building materials such as plaster or sheetrock. Horizontal cracks, however, can indicate that the entire house foundation perimeter is experiencing an unacceptable amount of pressure. Cracks can always be filled or addressed with house leveling, but the underlying factors need to be addressed first and foremost. Gaps in doors, window frames, counters, and cabinets. Doors and windows may not shut completely and “stick” to the frame, or you may notice a larger than normal gap underneath them. When the home was built, it is more than likely that the door and window frame was installed correctly, so these generally indicate foundation issues due to settling. Cabinets and counters that are attached to the wall and floor may also start to separate. This separation indicates points of pressure from a shifting foundation, in which case a house foundation repair will be highly recommended. Issues with floors are dependent on the foundation type and are another telltale sign a home foundation repair is needed. Squeaking or bending of flooring on pier and beam foundations may indicate a foundation problem. For concrete slab foundations, which sit directly on the ground, floors may be not be level. The greater the bend or unevenness of the flooring will be proportional to the underlying house foundation problems. Flooring can often be resolved when a home is leveled and the house foundation repair is successful. Foundations that appear to be sinking indicate an inappropriate amount of settling. Although settling is normal over time, if one side of your house is noticeably lower or higher than the other, or the center seems to sag, the issue needs to be addressed with a home foundation repair. San Antonio is notorious for expansive soils and a high variability in seasonal temperature averages, which contributes to this problem. In addition to treating the soil, foundation piers may need to be installed along the perimeter of or inside the structure depending on where compensation is required for house foundation repair. When a professional foundation repair company recommends foundation repair service, don't wait until it's too late. If you have house foundation issues, you may be in a tough situation if you need to sell your home at a loss with a damaged foundation, or even worse if the home foundation becomes irreparable. Our total home San Antonio foundation repair services include a free evaluation for restoring your home foundation to more than its original integrity, plus a warranty for completed work. Foundation repair costs vary significantly depending on the condition. Get in touch to find out more!